Our cooperative is very proud to develop wines that express the originality and the character of this unique terroir where Pinot Noir is the king grape variety. Moreover Pinot Meunier and Chardonnay, also growing in the Côte des Bar, enable the production of rare and inimitable champagnes according to the “champagne method” (“méthode champenoise”). OFFERING YOU WONDERFUL AND REMARKABLE CUVÉES REFLECTING ONE VISION, ONE STYLE … THIS IS THE OBJECTIVE OF THE CHAMPAGNE MARQUIS DE POMEREUIL! In 1922, having difficulties to sell their wines, 14 vine growers from Les Riceys come together and create the “Cave Cooperative des Riceys”, which makes it one of the oldest in Champagne. At that time white wines were produced for champagne trade, as well as red wines and the famous Rosé des Riceys. In 1927, the first champagnes of the “Cave Coopérative des Riceys” were produced and sold mainly on the local market, in Paris, Belgium and Northern France. In 1980, together with the expansion of the vineyard comes a more favorable era. The “Marquis de Pomereuil” brand is created, in reference to the lord of the Riceys (18th century). 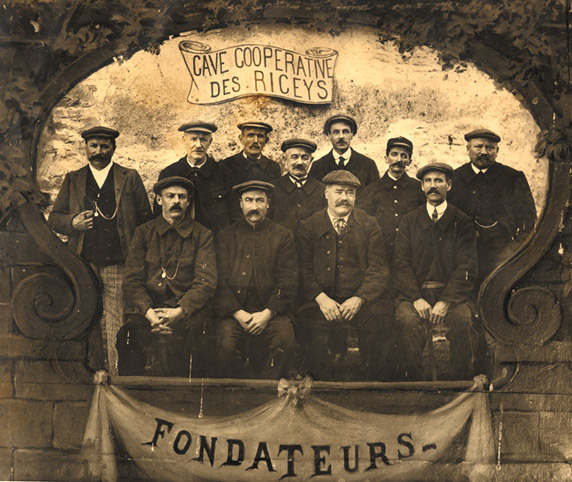 Since then, the Cave Coopérative des Riceys has never stopped developing over the years. Today, 55 winemakers conduct their vineyards with mastery and professionalism. 80,000 Marquis de Pomereuil flasks are produced each year! With 95 hectares of vineyard production, our ancestral know-how and our technical expertise enable us to grow our vines in strict compliance with the rules of environmentally-friendly wine-growing. The efforts and the entrepreneurial spirit of several generations of our winegrowers have made possible the modernization of our cooperative. Everything is done to offer a high quality of products and services to our visitors and loyal customers, not only for pressing and winemaking, elaborating but also welcoming and tasting. DEVELOPING CHAMPAGNES WITH EXCEPTIONAL AROMA FOR UNIQUE TASTING MOMENTS, THIS IS OUR DAILY MOTIVATION. classified churches, castles, and an 18th century hall. Considered as a real cultural wealth of the Riceys, the “Cadoles” – huts made of dry stones from the vineyards – were built at the beginning of the 19th century so that the vine growers could find warmth in winter, coolness in summer and shelter from bad weather.